Yup, more strings! I am foundation piecing on top of newspaper this time. The big advantage to newspaper is that it is thin and much larger than phone book pages, for example. I read somewhere on the internet that it works well and doesn't leave any black smudges on the fabric. So far so good! These blocks will be black on one side and white/low volume on the other with a red stripe down the middle. I almost have all the blocks done with the white and red strings. 8 more, then I'll start applying the black strings. Happy Monday! I hope many of you are off work for the holiday. I am linking to Judy's Design Wall Monday at Patchwork Times and Oh Scrap at Quilting is More Fun Than Housework. What a GREAT quilt this is going to be Kat! I can't wait to see how it turns out! I have always wondered about newspaper for foundation piecing as well,........I was always warned against it. But, looks like you are proving that wrong! 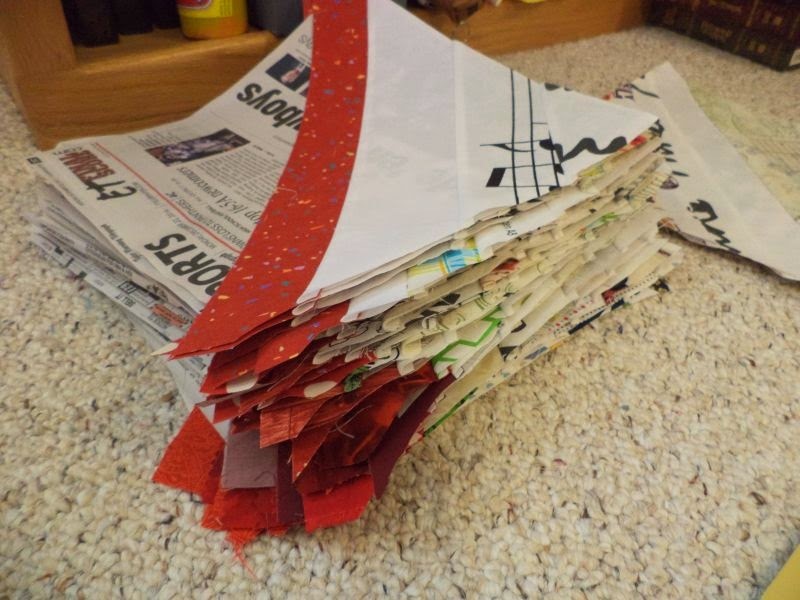 I like the color scheme you described, and I am intrigued by using newspaper! I haven't tried newspaper for foundations so I am looking forward to seeing what you think. I think these are going to be great blocks. Thanks for sharing with Oh Scrap! I like black and red together, and I like red and white together, so I am interested to see how this turns out. It sounds good. Thanks for the tip for foundation piecing. Looking good. I've always been worried the newsprint would run- glad to hear you're having no problems! I haven't heard about the newspaper for foundation. Glad to know it works. Does it smudge your hands though? I can't wait to see the finished quilt top, Kat! Whenever I've paper-pieced, I have printed lines (or lines that I've drawn on the paper) that show me where to sew. 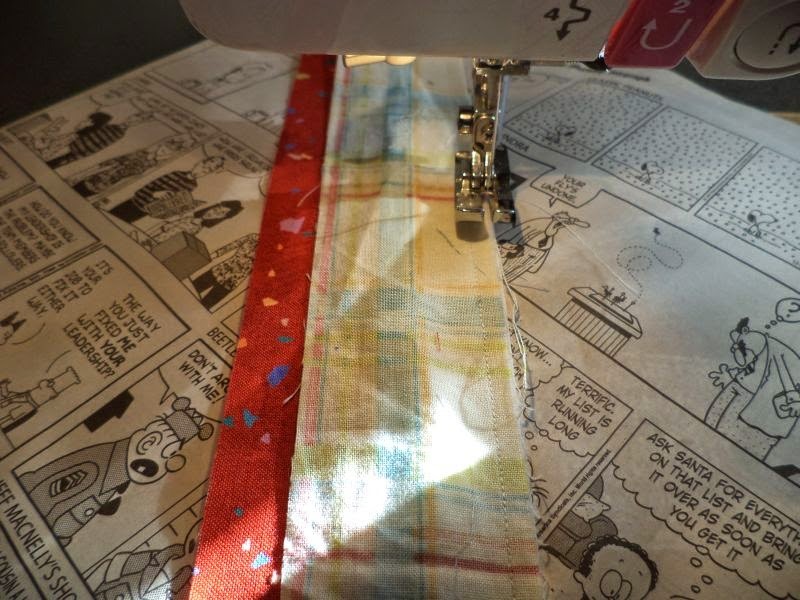 Are you using the paper as backing here to prevent your fabric from bowing?